As we enter the last full week of April, perhaps there’s a chance that there are only a handful of postponements for the week, instead of a handful each day. Samples at the plate and on the mound are getting larger, but still far too little to put too much emphasis on them. But let’s take a look at the week ahead for the best hitter matchups, two-start pitchers and batters you should consider picking up and getting into your lineups. Teoscar Hernandez, OF, Toronto – In 97 plate appearances last year, Hernandez had eight home runs and a .261 batting average. He’s going to strike out a lot (37.9 strikeout percentage last season), but he’s a power-speed outfielder with tremendous upside. He needs to be stashed in all category and roto leagues with five outfield spots, as he only has the struggling Randall Grichuk (.088 average, 33.8 strikeout percentage) in his way of regular playing time. Jed Lowrie, 2B, Oakland – Lowrie is rewarding owners who picked him up with his good start to the season, as he’s been a top 5 option at the position so far. Health has held Lowrie back over his career, as he’s only played more than 100 games three times in 10 seasons. Lowrie should be owned in all 12-team leagues at this point. Ryan Zimmerman, 1B, Washington – Yes, we’re going back to the well with Zimmerman, who helped fantasy owners in a big way in 2017. He had a two-homer game on Wednesday but has struggled besides that. However, he leads all of baseball in average exit velocity (96.5), according to StatCast. In that lineup, we’ve seen what a red-hot Zimmerman looks like. Amir Garrett, SP, Cincinnati – With Bryan Price out as manager, Garrett might finally get the chance to enter the starting rotation. It’s not like there’s a lot of competition for him to overcome. Aside from Luis Castillo, Garrett is easily the most talented pitcher in Cincinnati. 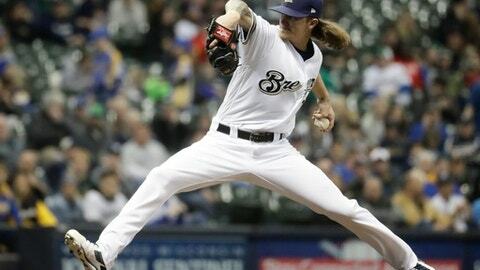 Josh Hader, RP, Milwaukee – Whether it’s closing, starting or an Andrew Miller-type role, Hader needs to be owned in every league. He’s the best reliever in baseball right now. Mac Williamson, OF, San Francisco – Hunter Pence just doesn’t have it anymore, and the 27-year-old nearly broke camp with the team and is hitting .487 in Triple-A with a 1.626 OPS. He needs to be stashed. Vince Velasquez, SP, Philadelphia (Arizona, Atlanta) – Velasquez would be more attractive if he was on the road in his first start, but alas, he’s showing more flashes of his 2016 self when he broke out than his 2017 season where he was injured. Velasquez’s peripherals show he’s better than his 3.80 ERA may indicate. This may be your last chance to pick him up. Matt Davidson, 3B, Chicago White Sox – With eight games on the schedule, you’ll want some exposure to the White Sox. Play the power upside with Davidson. Preston Tucker, OF, Atlanta – With excellent matchups for the week ahead, and with Ronald Acuna yet to get hot enough to call up to the big leagues, Tucker is a sneaky play in Cincinnati and Philadelphia. Shin-Soo Choo, OF, Texas – Choo has always been an underrated fantasy option throughout his career, and this season is no different. With four of six pitchers that Toronto and Oakland will be running out to face Texas next week looking very hittable, Choo – who is leading off for the Rangers and hitting for power – is a must-play option.